Pseudo Sun - "Future Memoirs"
Formed by DarXtar's Juba after his departure from that band in 1994, Pseudo Sun plays heavy spacerock that is sometimes DarXtar/Hawkwind influenced, and often heavy 70's metallic jam rock influenced. Juba contributes bass, guitars, keyboards, and vocals, on all songs. On four tracks he is joined by Bjorn Jacobson on guitar and Patric Danielson on drums, and on one track Gunnar Oberg handles guitar and Calle Thalen plays drums. Juba plays all instruments on a sixth track. "The Future Rears Its Ugly Head" opens the disc and reminded me of a harsher DarXtar. This is easy-paced driving jam rock with lots of synths to give it that spacey edge. "Fulcrum Of Time", the one song with Oberg and Thalen, is full blown driving metal á la Judas Priest, and as a child of that era I found myself head banging away. "Secrets Of Infinity" is a Juba solo piece. A simple tune, it is a nice personal touch by Juba with its combination space synths and acoustic guitar. The two strongest tracks, and the ones that hands down make the CD a success, are "The Time Traveller" and "Signs Of Life". "The Time Traveller" sounds very much like something off a DarXtar disc. This is cosmic spacerock that jams, explores, and develops slowly but steadily. The guitar cranks out gorgeous melody lines putting this right up there with DarXtar's "Into The Unknown" and "7". The pace picks up with a driving drum beat while the guitar continues soloing and the synths gurgle in the background. Definitely a tune that would appeal to both spacers and the heavy prog rock crowd. "Signs Of Life" is another metallic rocker, though much different from "Fulcrum Of Time". More along the lines of early Black Sabbath, the tune offers a pounding bass and the most blazing guitar on the disc. Over its 12 minute length the tune develops as a classic 70's heavy rock tune with the addition of space synth. Always a nice combination. 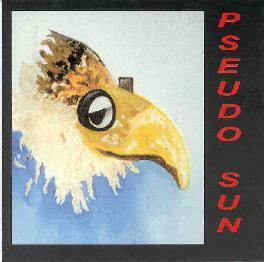 In summary, Pseudo Sun should appeal to the heavy rock crowd who like a good chunk of metal with their space. My only criticism is I had a tough time getting used to Juba's vocals. Chris Lunderson provided the limited vocals on "Signs Of Life" and I wouldn't have minded if he handled all the vocal duties.